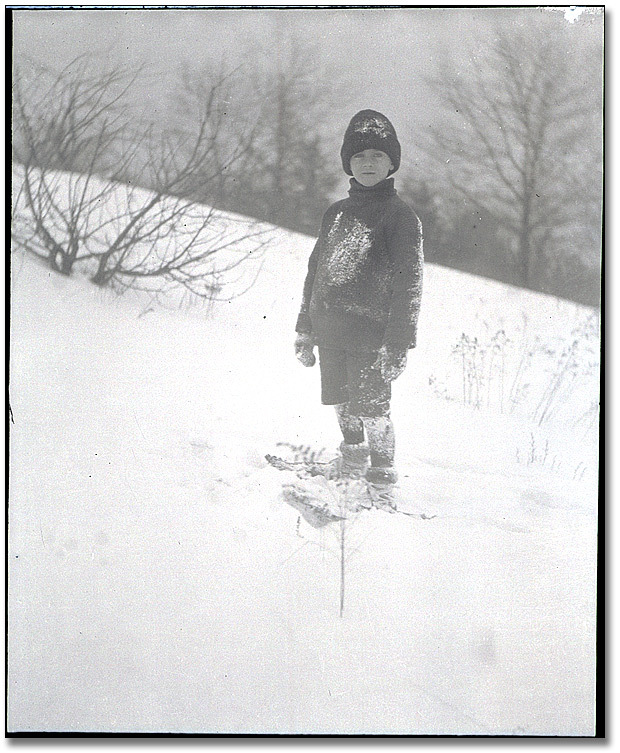 Last week was the first of my 2013 historic winter sports posts with Early Snowshoes For Man and Beast. 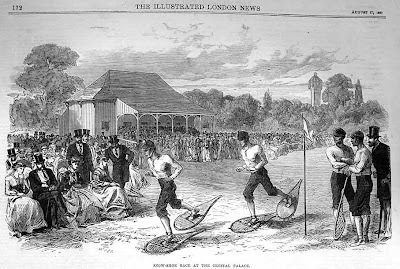 But lest anyone thing snowshoeing is only a winter sport, may I draw your attention to this 1867 print which shows an actual race on turf. published by The Illustrated London News. As noted in the caption above, the print was published along with the race results in The Illustrated London News. Yes, it was a real race and proved to be great entertainment to those gathered to watch. 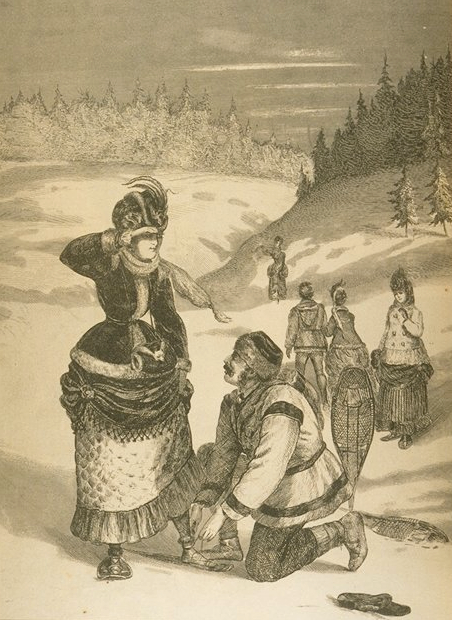 But snowshoeing wasn't that entertaining over on this side of the ocean where it sometimes became the only method of transportation through the deep snow. According to the Encyclopedia of French Cultural Heritage "The first inhabitants of New France had to borrow snowshoes from the Amerindians to get around on foot when snow lay thick on the ground. These snowshoes were made from sinew (leather thongs) knotted and braided on a wooden hoop ... The troops of Canadian and native militiamen led by the brothers Le Moyne (Jacques Le Moyne de Sainte-Hélène and Pierre Le Moyne d'Iberville), to name one example, crossed considerable distances in snowshoes to strike British villages and outposts from New England to Newfoundland in the 1690s." 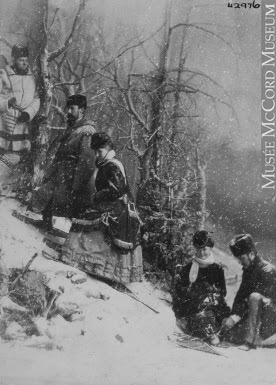 However, it wasn't long before North Americans saw the recreational value of the snowshoes and formed a club. 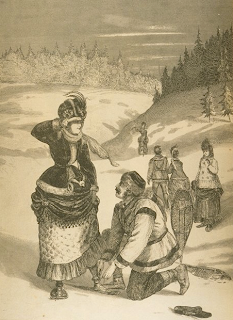 The Victorian Age emphasized a sound mind as well as a sound body and encouraged physical training for men and women. Snowshoes clubs allowed participants to enjoy the sport together, often ending the time with a cup of hot cocoa. Inevitably, racing provided a goal as well as entertainment. 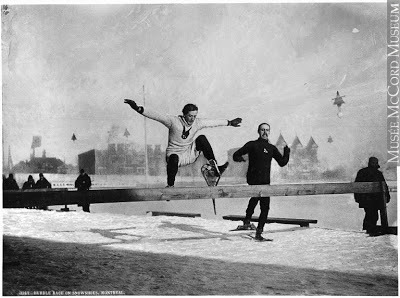 Who can turn away from a rousing snowshoe hurdle race? It reminds me of the sport of steeplechase. Does that look as dangerous to you as it does to me? So much for extreme sports being a product of the 20th and 21st centuries. Snowshoeing isn't limited to adult men and women. 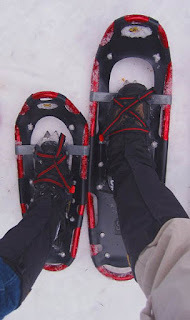 Anyone who can move their legs can walk and/or run on snowshoes. 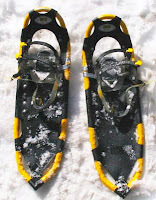 Snowshoes are round, oblong, pointed, long, and short. I used to think they were different depending on who made them, but I've since learned that it also depends on what type of snow you'll be travelling on. - mountaineering (the largest, meant for serious hill-climbing, long-distance trips and off-trail use)." 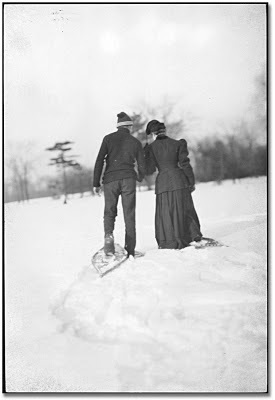 And of course, two people alone, not having to worry about anyone hearing their tentative words of love ... snow crunching beneath their feet ... cheeks and noses tingling from cold, but adding to the awareness of being with that special person ... how positively romantic. ARE's Brave the Blizzard Snowshoe Race. So, are you game? Which type of snowshoes would you buy if you had the chance and the time? Cute, Anita. 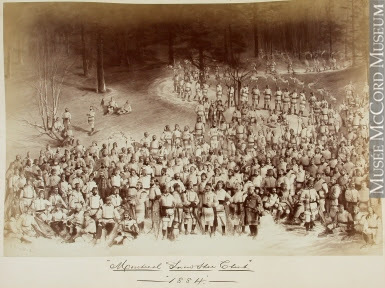 I love the picture of the snow shoe race without snow. I can't imagine hurdle jumps in snow shoes. Yikes. Suzie, I agree. I can't imagine them NOW with the smaller racing snowshoes. Those long ones, though, seem like suicide. I take my hat off to the photograper who took the hurdle photograph though - such clarity in a moving pic. wow. Great post, Anita Mae. As usual, your photos are fabulous. I learned a lot, too. 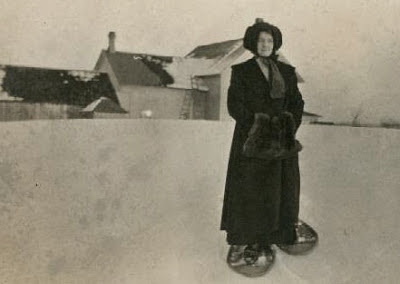 I've certainly had days when I needed snowshoes just to get home -isn't that crazy? Since that one particular winter, I haven't needed them. Anita, have you used them yourself? I was also amazed at the illustrations with such details. What a great subject, and post. Thanks! Super cold here too, and Anita, you've inspired me. 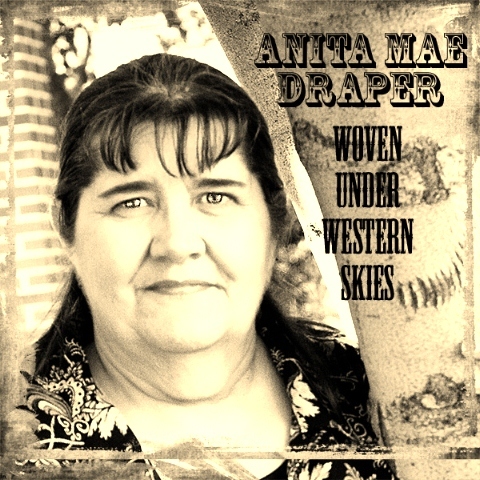 Anita, these are so fun! I shared your last post (with the snowshoes for horses) with my parents during our Sunday breakfast together. Yes, Debra, I used them quite a few times - back in the '70s and '80s. Then I switched to cross-country skiing because they were narrower. 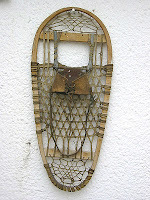 I found those old long snowshoes too hard to keep up my energy, but the skiis were great 'cause I could glide. Then we had the goats until 2005 and with them, I was too tuckered out to play after my chores were done. And thanks for telling me. your post makes me want to learn to snowshoe, Anita. of course, that would involve me moving back to Colorado, where i could find snow (none around the beach). i had friends in Colorado who participated in in snowshoe racing/clubs. they always had the best looking legs too. very cold here today. off to find some hot chocolate. Yes, running with any kind of weight on your feet help shape your legs. But do they get - uh - enhanced - thighs like speed skaters? Very cold today here too although it has warmed up to -14C from -24c this morning. That's still below 0to anyone on the Imperial scale. Brrrr.